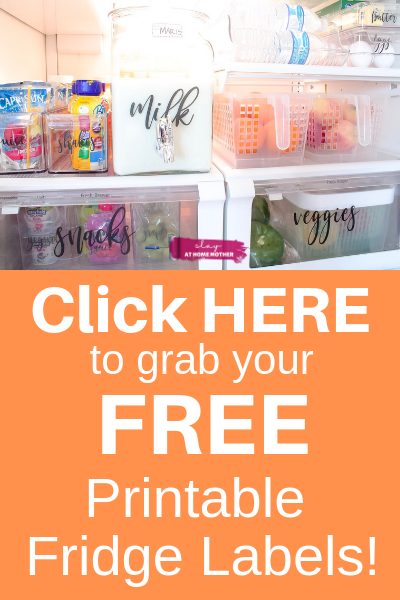 I’ve partnered with Gardner-White for this post, however all opinions are my own (as always), and I only share brands I love and trust with my readers. Hi friends! 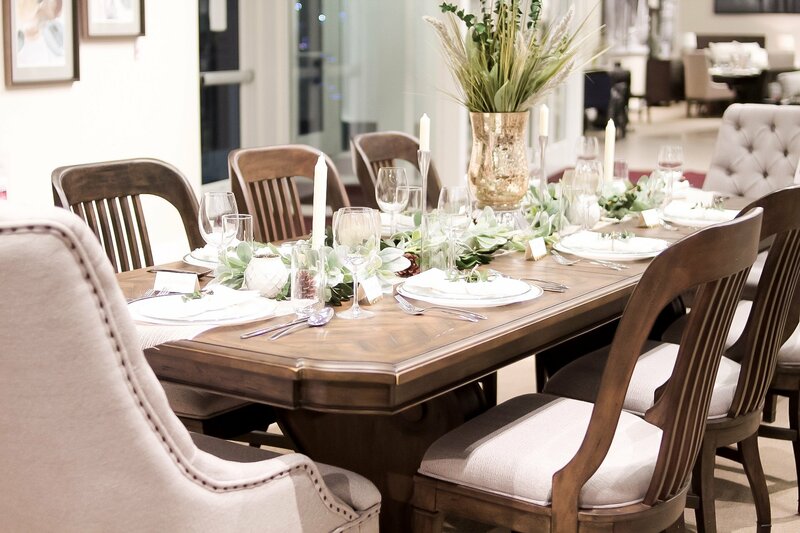 I’m so excited to say that we’ve decided to upgrade the furniture in our living room, and grabbed some additional pieces for our home as well at our local Gardner-White Furniture store. As you probably have already read on my blog, we have completely renovated our living room and dining room – so I’m itching to change up the last remaining ‘original’ furniture pieces in our home! 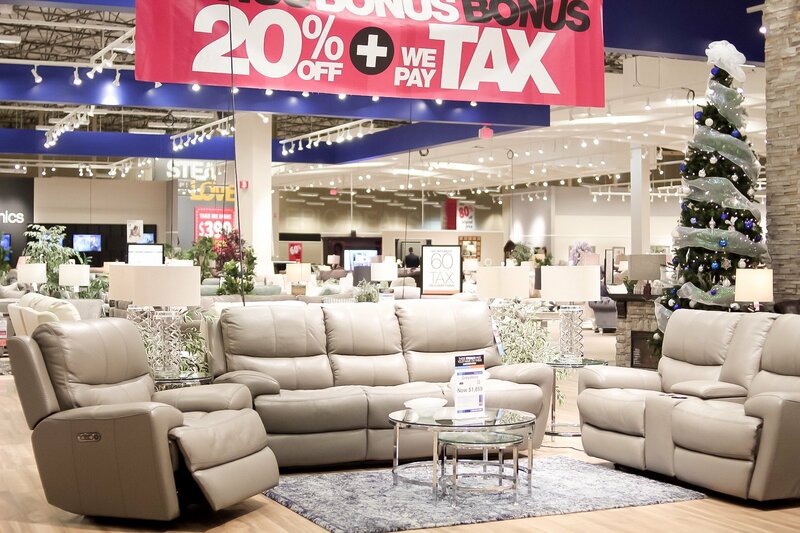 Our current sofa and love seat set is from Gardner-White, a quality-based, family-owned furniture company in the Metro Detroit area. The couches have been so wonderful to us over the years, and I hate to break up a good relationship, but our style has drastically changed! 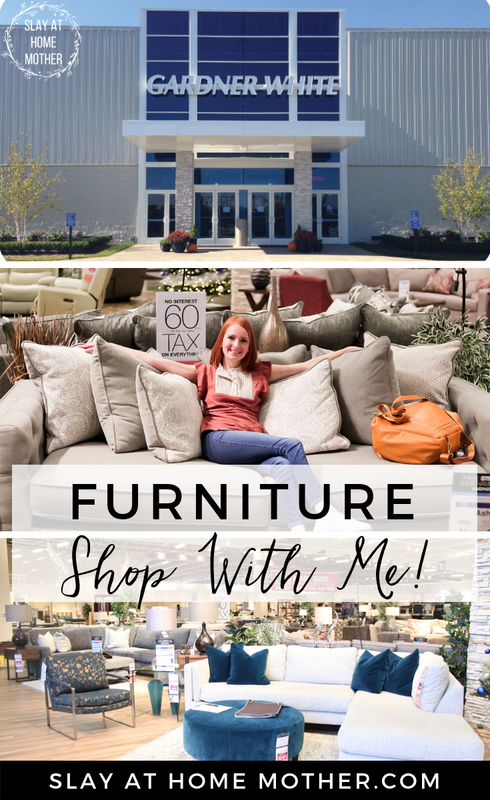 So, I quietly whispered a quick “It’s not you, it’s me….” to our used furniture and bolted out the door with my vlogging camera and family in tow in the search for something more stylish. I think we timed it perfectly! We opted for the first option as we didn’t need to finance this time around. 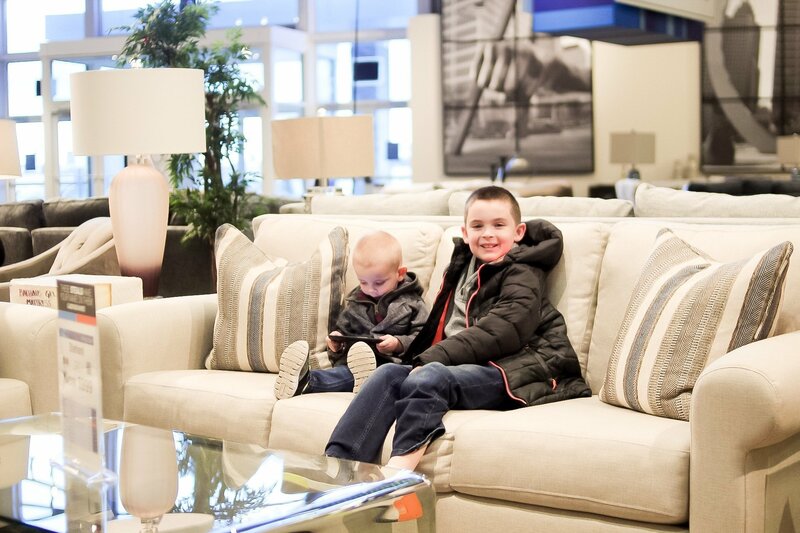 BTW – If you want to see my latest video and ‘Go Furniture Shopping With Us’, there’s a video of our shopping experience with our kids at the bottom of this post 😉👇👇. Don’t worry, I’m a visual person myself, no hard feelings if you prefer video to words! 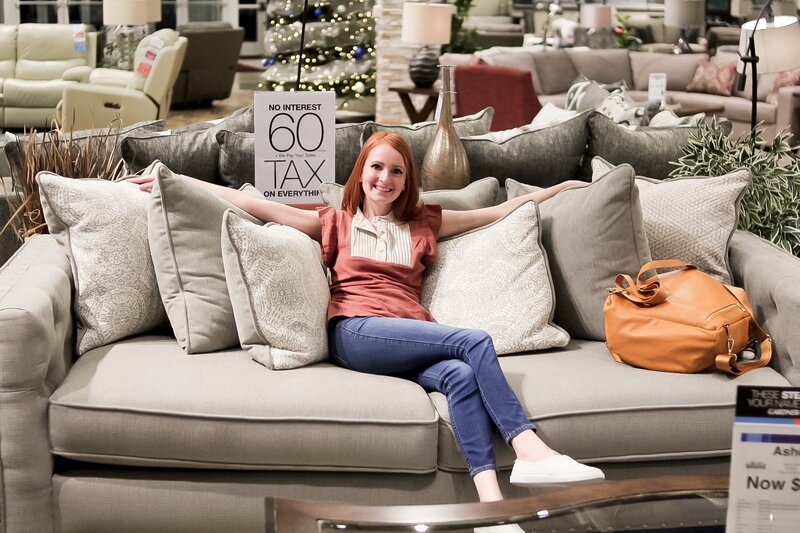 My first choice to replace our tried-and-true set at home was the Viewpoint pillow-back sectional – it was INCREDIBLY soft in person, and had so many beautiful pillows! 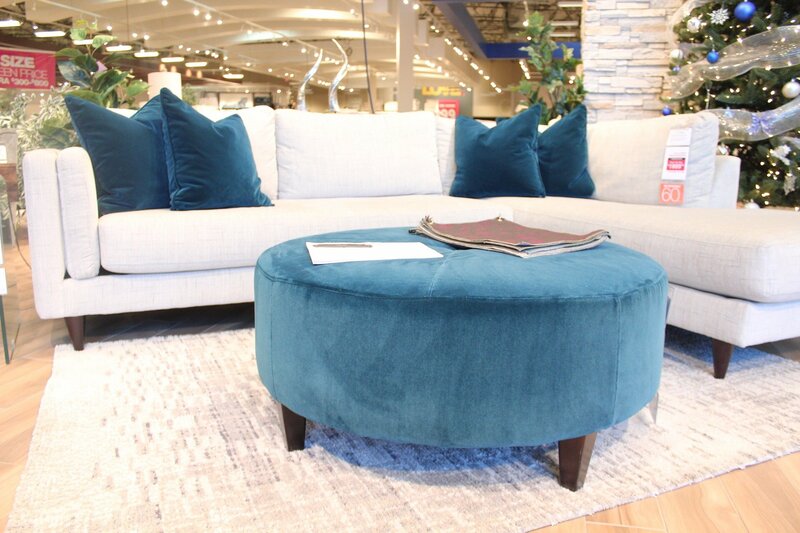 Unfortunately, the measurements wouldn’t work for our living space, and the opposite configuration we would need wouldn’t be available for a while, so I sadly said farewell to this sectional – but I did give it a few mournful glances across the store. I can’t even tell you guys just how SOFT it was. I’m still a little upset about it. Forgive me while I play my tiny violin and weep. 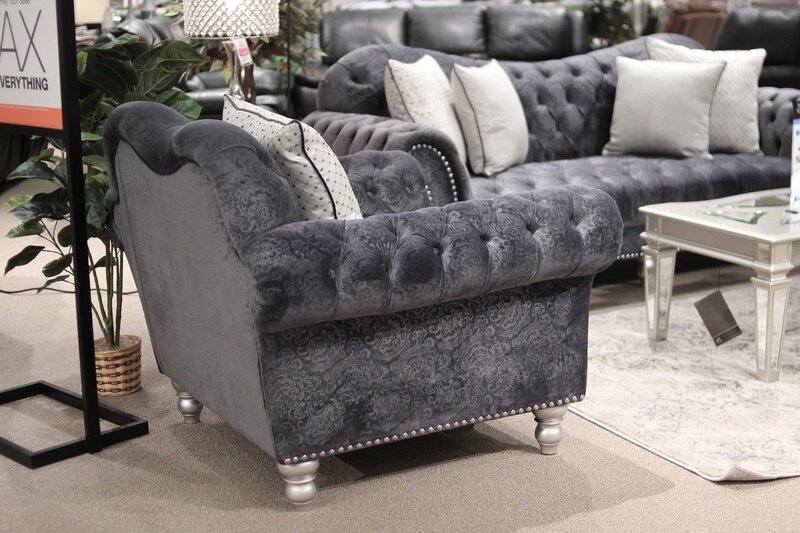 Another contender for our home was the Belle/Castille furniture set – it had all the elegance and amount of fine details I liked, and allowed me to picture myself in a bath robe with perfectly pedicured toes, with a mimosa in one hand and one of these soft pillows in the other! Unfortunately, when you’re married, your husband doesn’t always agree with you, and I needed him to love our new set too! 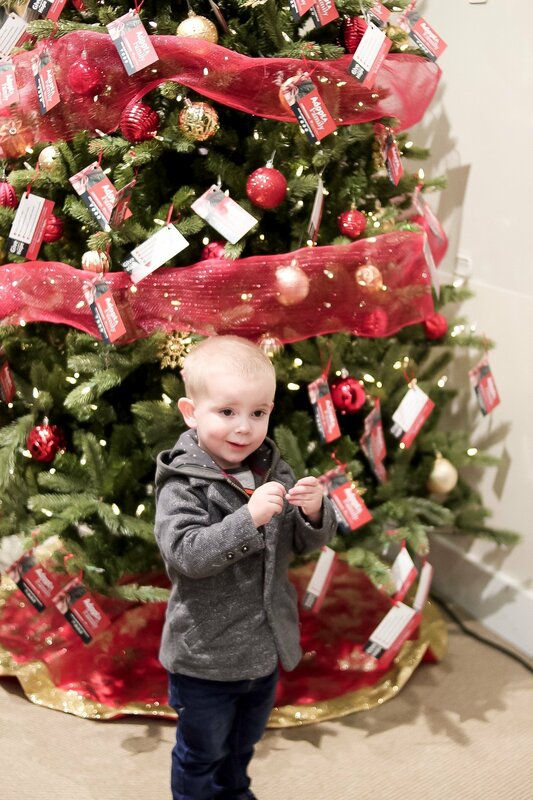 This little booger of mine – phew! He kept us busy for the entire two or three hours we spent in the store! 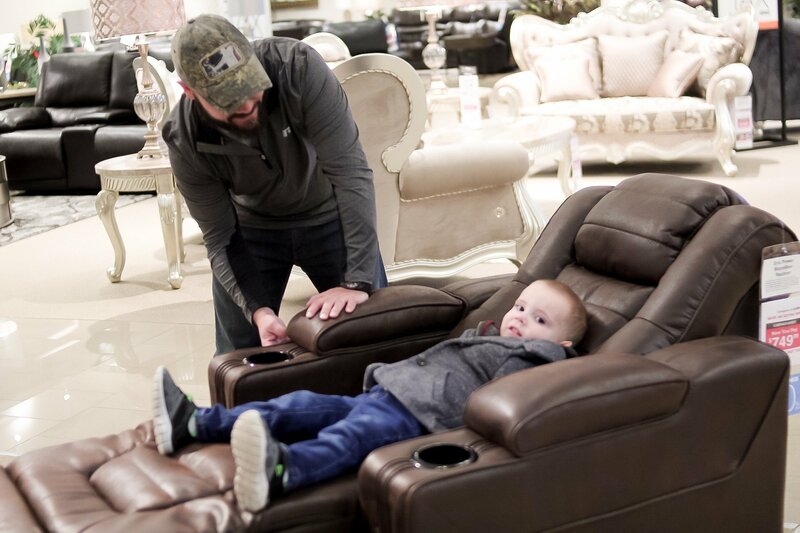 He was either running like a swarm of killer bees was after him, or laying back every recliner that had a button! 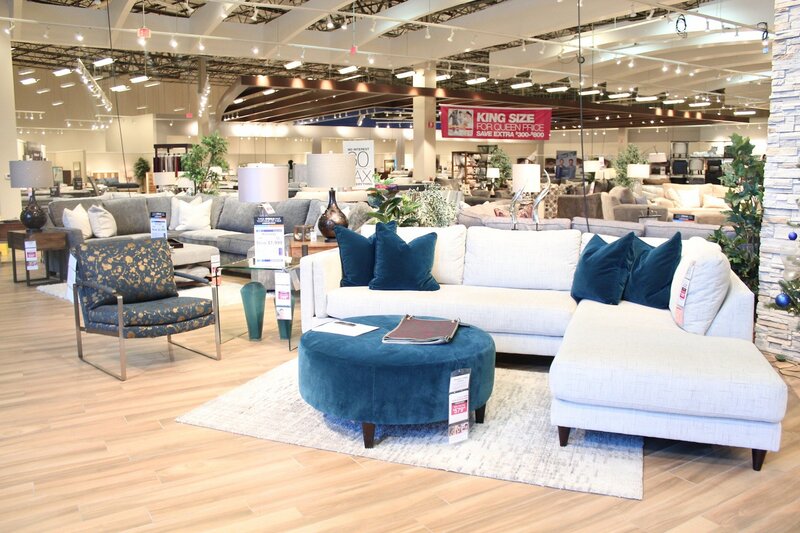 Chris and I heavily debated the Kennedy collection (pictured below), with the beautiful dark teal ottoman and coordinating accent chair – but fabric that light with children seems like it might be a bit of a headache. Protection plan or not, ha! I think if my youngest was about 10 years or older, I totally would have chosen this set! 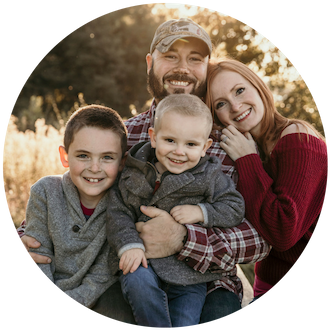 Gardner-White has an excellent protection plan BTW – they basically cover everything but jaws, claws, or paws. So, technically speaking, if we opted for the Kennedy set and did happen to spill some unwanted liquids or experience an accidental tear, we’d be covered! You can read more about exactly what they’re protection plan covers (and what’s excluded) HERE. 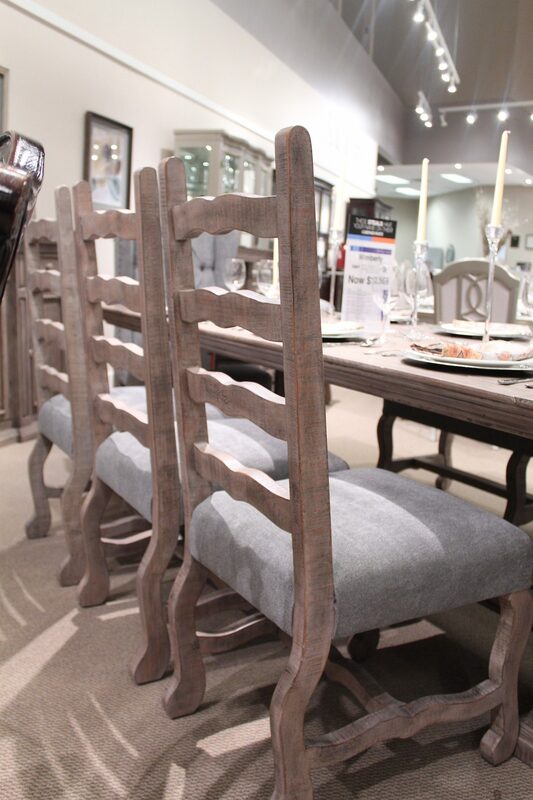 I lovingly referred to these accent chairs as The Wall Of Chairs while we were walking around. Isn’t the display gorgeous? 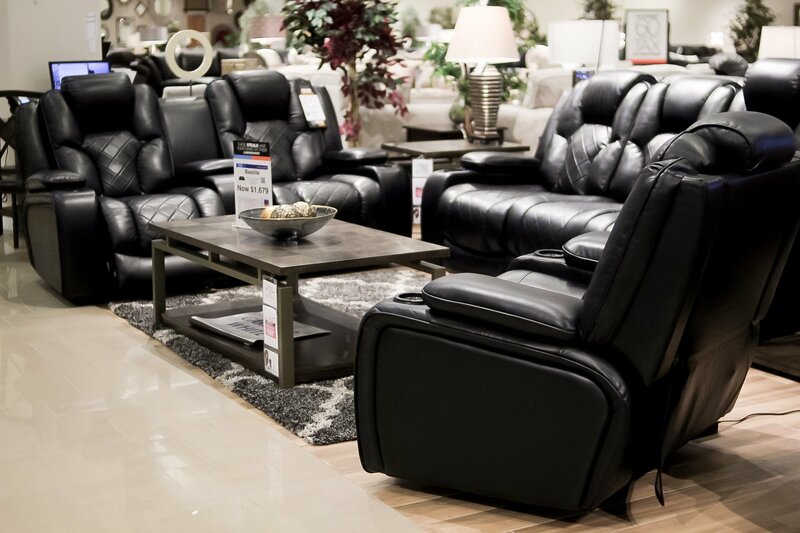 The Bastille set was one of Chris’ favorites – he has a thing for leather furniture! I have to agree with him – it’s absolutely stunning! However, I’m not a fan of leather or faux leather, so this wasn’t the right choice for us. 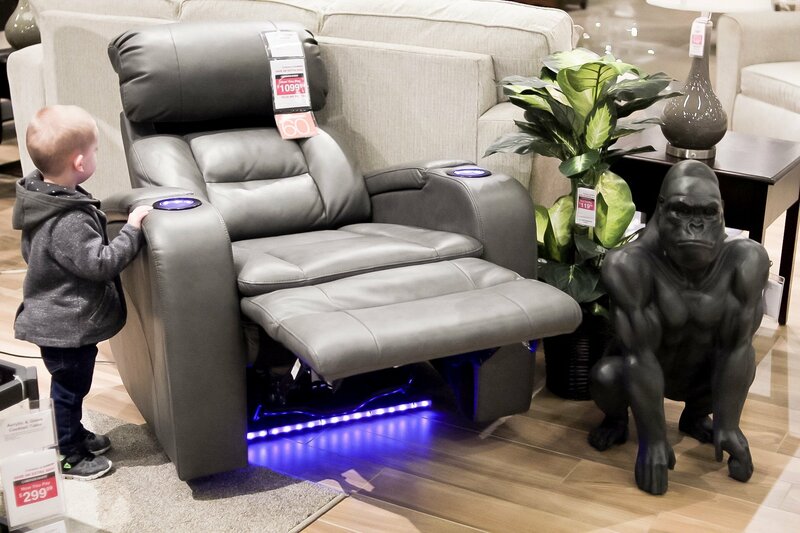 I think if I left our decision up to the kids, they would have totally chose the Highway To Home Power Reclining Microfiber sectional – I could hardly pull them away from it! 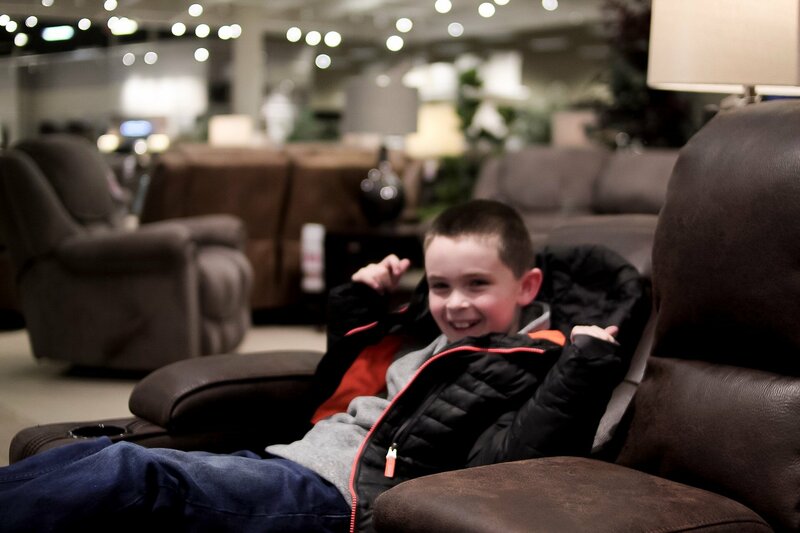 They spent about 50% of the time reclining in the chairs – the other 50% was spent running through the store. Thankfully the staff understood how kids are, and kindly offered us waters and snacks to keep the boys occupied so we could shop! The awesome part about this set was the ‘wedge’ that fit between the two sofas to make the set a ‘sectional’. It features Bluetooth speakers, pop-up USB and A/C power outlets, and a storage drawer towards the bottom! Fancy, eh? Here’s the one we chose (below). Before I tell you about it, I want to mention that the Viewpoint is DIRECTLY behind it. So, I felt a little like a total cheater in this scenario. But, I’m really happy with our second option – the Asher furniture collection! 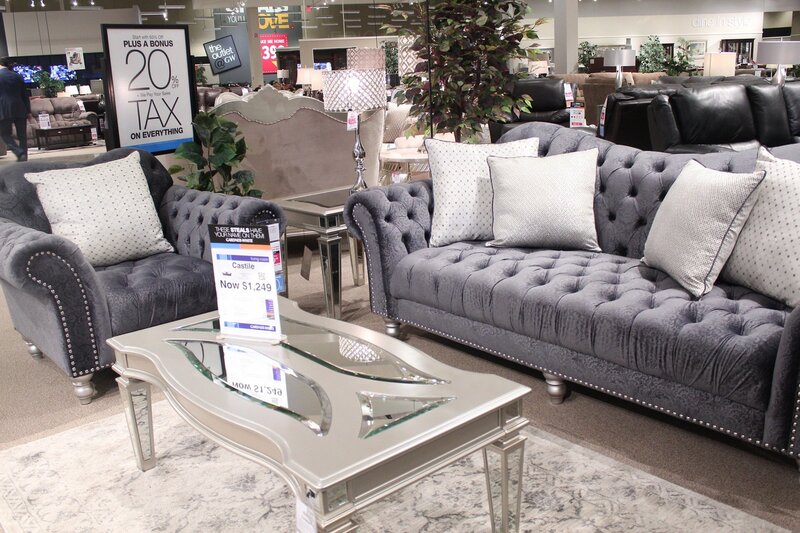 I instantly fell in love with the polished nail heads on the arms, the firm cushions, and the pillow-back design. 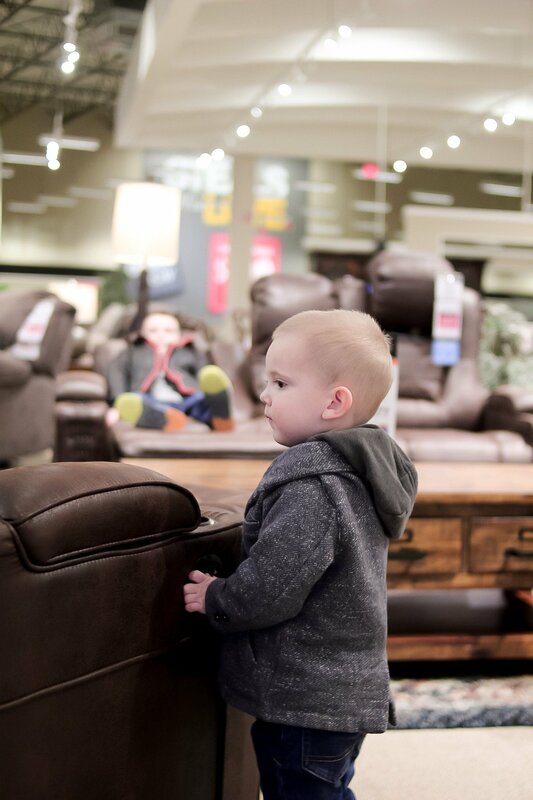 I also loved that the entire piece of furniture was padded – I can rest assured that my kids aren’t going to injure themselves when they are wrestling in the living room or jumping over the couches after I’ve asked them not to ;). I’m also a big fan of seasonal pillows, so I can already picture swapping out the printed pillows that come with this set for some Christmasy pillows to match our holiday decor! 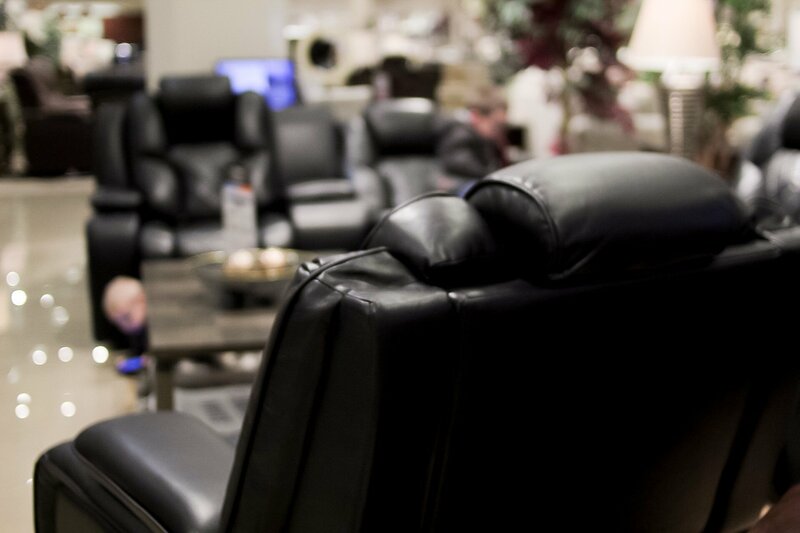 We opted for the sofa, love seat, and ottoman from the Asher collection by Sofa Master. Our salesman, Jerry, helped us pick out some FAB side tables and a matching tv stand by Cannon Valley to go with our new living room set, and two upholstered dining chairs (for our custom-built bench style farmhouse dining table). 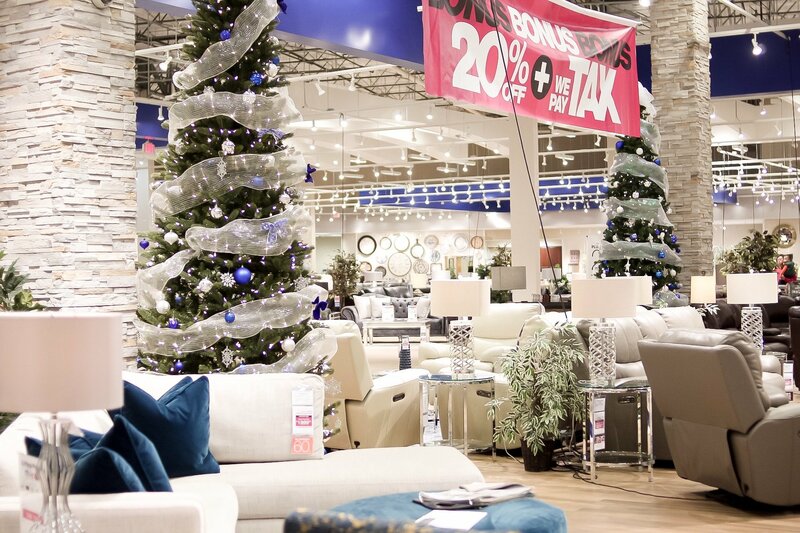 Overall, I enjoyed our shopping experience at our local Gardner-White, and highly recommend my Metro Detroit readers pay a visit to your local store – the savings + the quality are incredible! 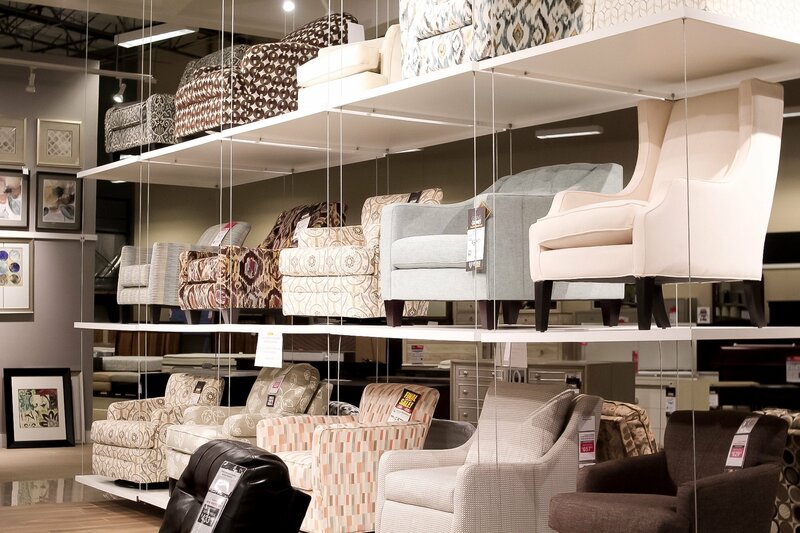 No matter what your budget is, Gardner-White can help you find the right set that works for your style and your wallet. I’ll be sharing our living room furniture refresh with you guys here soon, so stay tuned and don’t forget to subscribe so you don’t miss any of my upcoming blog posts this holiday season! 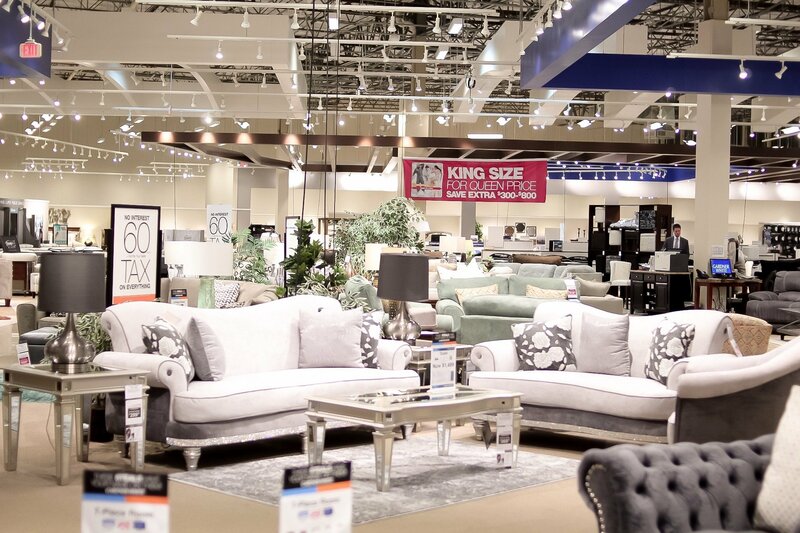 When we finally build our new home, I’m going to be doing so much furniture shopping. I can’t wait! Wow the first couch is stunning! 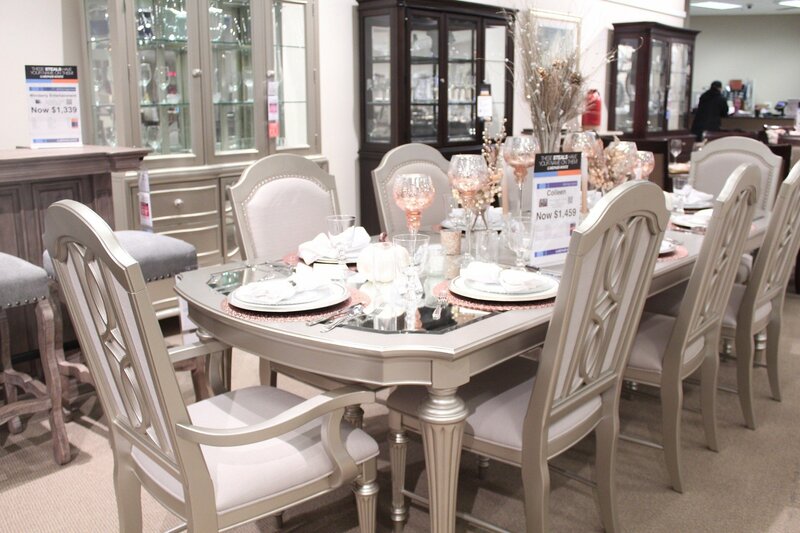 I absolutely adore forniture shopping! I love how bright and clear your photos are! I love the set you ended up choosing!